A "vesselcontrol.dll" would be nice and could be used standalone (without multistage) if needed. It could run on top of existing vessels and add the landing point equation for instant 2016 compatibility. I think that could be interesting but it would be beyond the scope of what I am looking for here. Recapping: the point is the actual multistage structure (the unique vessel which spawns the various stages) works fine, BUT I always had the doubt if it would be nicer to have a more realistic multistage structure with each stage a single vessel that it just separates on the flight. Recently in a discussion Urwumpe (which is a very knowledgeable user here) pointed out the same and stated that it would be much nicer to basically be able to choose payloads and maybe stages architecture on the go (if I got it right). While this is theoretically almost possible with the current Developer Mode Dialog of MS2015, it tickled my fantasy again of making the multistage module flying an actually multistage vessel, composed by various vessels, as said before. physics in Orbirer is currently properly computed with docking and it is not with attachments. to do it properly docking should be used (now that it is possible in Orbiter 2016). the docking APIs provided with orbitersdk are poorer comparing to the attachment APIs. I could elaborate this a bit more and try to recreate the same commands of attachments, but it is not immediate since docking is thought for something different. therefore maybe attachments are better. They are also much more versatile. But then there will be the need of updating the whole set of physics of the rocket at each staging event, exactly like the current system. the only proper way I see to do it IMHO is to just use the last stage as core. An independent plugin can be used for general management, maybe to make it usable more like KSP (even though I never played KSP). the developer mode dialog shall be untied from the multistage code and walk with its own code (but that is another story). the only proper way I see to do it IMHO is to just use the last stage as core. This is how it's done on real LVs, the actual flight computer(s) are located on the last common stage. For Delta IV, this is the DCSS and for Atlas V, it's on the Centaur. The lower stages only react to commands sent from the upper stage. The Saturn V/1B flight computer, called the Launch Vehicle Digital Computer (LVDC), was located inside the Instrument Unit (IU) ring that sat on top of the S-IVB stage. This was true even for the Saturn V that launched Skylab as Skylab was just a modified S-IVB stage. On multistage the user defines each stage parameters, including the position of the meshes. If you use docking, vessels limit you to the existing docking ports. So you'll need to overwrite all of that to make it work for the end user. ... (I said attached, because docked is possible but I found the docking available commands too general to manage such a complicated situation like Multistage module is). Could you expand a bit on what you mean by "too general"? If there are specific interface functions missing in the API you would need to implement your module, I'd be happy to consider adding them. In general, I'd like to encourage using the docking, rather than attachment mechanim, since it takes into account the modified physics of the assembly (mass, PMI, angular moments, merged touchdown hulls, etc.) Attachments don't do any of this, so the addon developer would have to implement those things manually. Attachments were really only meant for sticking small bits onto the main vessel that wouldn't change the vessel behaviour significantly. Nonono... just payload (and maybe upper stage) would be enough. Do you remember Kulchs Payload Manager SDK? Something like that would be sweet. Sadly, it is a bit outdated now. Not always, you can also have hybrid solutions there - for example a launch vehicle guidance for the first two stages and a guidance for upper stage and payload by the payload guidance computer. Sure, the main issue is that the AttachChild/DetachChild commands of the Vessel class uses the attachmenthandles to attach the vessels, while the Dock/UnDock command of the vessel class uses docking port numbers instead. And there is no API to go from Handle to Port number (only the other way around). Considering that everytime there is a deletion of a docking port all the numbers after it make a step back, when there are a lot of docking ports it soon becomes quite a mess to keep trace of the correct port to use. Even if I don't delete the docking ports and just undock the stages, I can pick the correct port only if I have kept a very linear trace of docking creations. Now, it just came to my mind that a possible solution could be to make a small function which recursively checks through all the ports available if the dockhandle that I am looking for is equal to the dockhandle of any of the ports and in that case returns the port number and then basically create some MyOapiDockFunction and MyOapiUnDockFunciton which use that system. plus all the safety checks to be included. The other difference is that moving an attachment point is easy and works, while moving docking port is difficult. So if I want to "move" stages or payloads to fine tune the setup of my rocket I can't do it. That is already basically possible. not super quickly as it was with Kulch's addon, but neither this far. And payloads can be live as well, so not spawned. Relevant to live payload it is possible to make the shuttle by placing the orbiter as payload, making the rest as multistage jump in the VC of the orbiter and command the sequence from there. Same for capsules above any other rocket of course. So in theory - spawning a MS2015 vessel during runtime is possible? 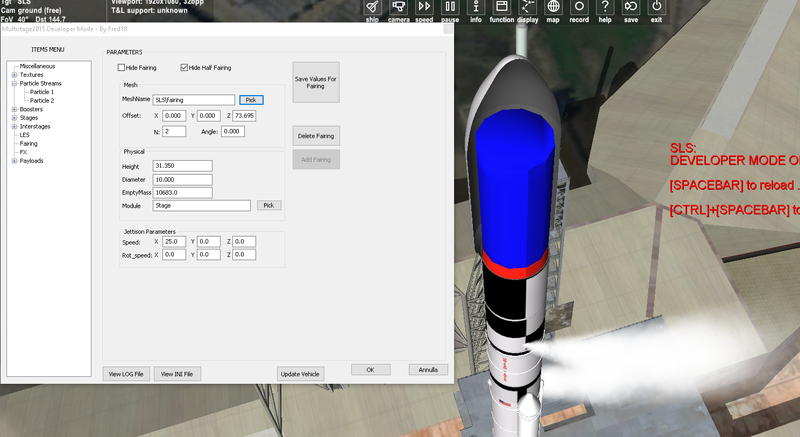 I never tried from 0 with the scenario editor actually... but if you start your scenario with just a monostage basic vessel with just the most basic definitions needed then you can change everything, add stages, boosters, payloads, place them in correct place, test the rocket and then reset it to the ramp,... you can also edit the ini file and then reload the rocket during runtime (which gives the idea that you can do anything you want). Maybe a "stage attachment" type of connection is needed, which behaves exactly like a docking port, but has its own port numbers and deletes automatically if not attached to something (either at scenario start, as with a core with optional boosters that aren't attached, or if detached in flight, as with a staging sequence)? Yes, about that. Practically, I just want to be able to build a space station and spawn a rocket to launch the modules. Of course, an assembly building would look better, but its not needed for the "game". This code above properly written actually works... but still I see other advantages in the attachments apis: the attachment is not automatic while docking is (if I understand it right), so it is much more controllable by the developer, it has also the id string that can be checked, it's really "stable" when deleting attachments (while I experience some CTDs when deleting docking ports), and as said point movement is easy and smooth with attachments so if I want to build a vehicle with various stages I can connect them and then slightly move the points at runtime to make the match perfect. - Due to this new linking system many things can be simplified: first thing I did is the booster system: no more meshes turned, named with "_1" "_2" etc, but just one mesh for the booster vessel, and the booster vessel will be replicated N times. This allows to change the number of the boosters on a rocket by simply changing the N parameter without doing anything else. I am using as usual the demo SLS for the developing and I just changed N from 2 to 20 or to 5 and ZAP! boosters are there up and running. - The rest of the tructure should be quite easy to make, I have some doubts with fairings: the system used for the boosters could come in handy, but often textures for one piece of fairing is different than the other, so just replicating a fairing vessel could produce a not perfect result. - The idea in the end is also to rethink the developer mode, so it will be easy to change or move stages/boosters/payloads directly in the sim with just a few clicks. As said, I never played KSP but from what I saw this could become easily similar to the assembly part of it. The booster system based on a single mesh will not be usable for all rockets. But it's a nice option to have! For the fairings, it's the same. On some cases a single "cloned" mesh will do, on others we need different fairing part meshes. I'm not sure that I follow your plan, but I wan to add one point regarding multiple attached vessel stacks: JUst make sure that the vessel that ends up in orit is the one that starts outon the pad. IIRC, in old Velcro rockets, you launched from the bottom stage focus and ended up in the upper stage focus. This made it difficult for intrplanetary missions because it reset all the MFDs, and you had replan your IMFDs, etc. 1) I made it sure that the focus core-vessel is always the last stage of the rocket. 3) that brings burntime mfd for example to a proper deltaV computation in the configuration "last stage + payloads/adapters"
2) is last stage+eventual adapter+payloads enough as long as masses to be correct for interplanetary ejection burn? my guess is that it should be: fairings are jettisoned far before the ejection, and I can't think of anything else that could be relevant in this case.